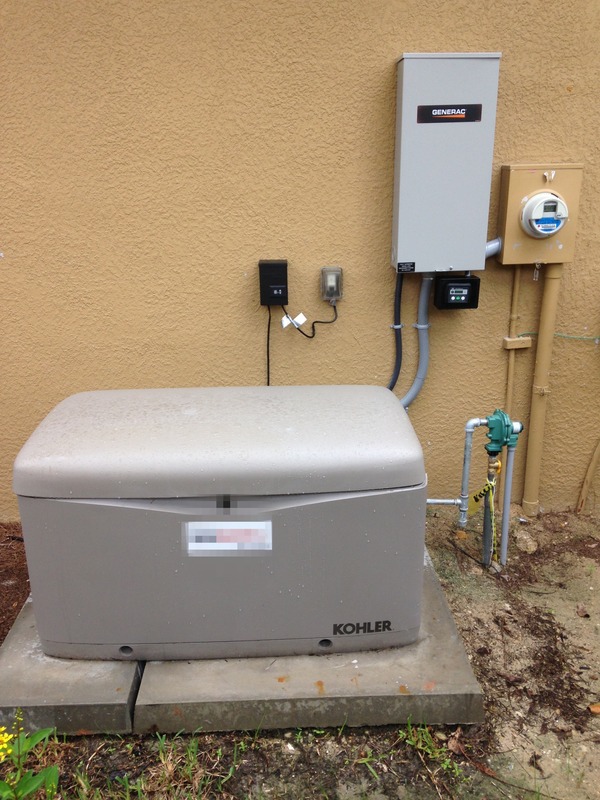 A little over a year ago, West Coast Generators went to an interested buyer’s home to give him an estimate. Our estimate included a Kohler 20RESA generator, a Kohler automatic transfer switch, a poured in place concrete pad, gas connection, start-up and warranty registration. The buyer clearly stated that he was getting other bids and we were to keep our pencil sharpened. We gave the buyer a very fair price and he accepted. The buyer had sent a deposit check and when we received it we received a call from the buyer stating he had cancelled the check and was moving forward with another local contractor. We did not hear from him again. Just the other day we were in the same neighborhood as the previous buyer and decided to take a look at the install that he paid for with his hard earned money. This is the horrible generator installation he paid for and received. We can see several obvious problems with this bad generator installation and a few more that were under the lid. 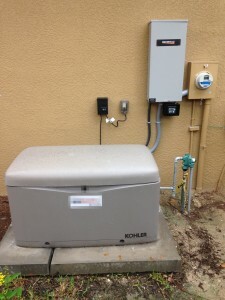 The first and major problem is the fact that the contractor did not use a Kohler automatic transfer switch. The contractor just eliminated a number of features that this generator is capable of doing but now can’t use any of them. Not to mention the fact the the contractor had to rig this Generac switch to work with the Kohler generator and certainly voiding the warranty. Another problem is the green gas regulator. That regulator is for LP gas and has a different operating pressure than natural gas. I would guess that this generator would not run properly under a heavy load. Another problem there is a separate external exercise timer mounted to the bottom of the transfer switch. This unit was installed over a year ago and has only 1.5 hours of run time when it should have over 12 hours. The lifting holes of the generator were never capped and the generator is mounted to a split pre-formed pad that looks unstable. I would guess that if we dug deeper we would of found the software was not updated and this generator was not even registered. It is imperative to to hire a contractor with the knowledge and experience necessary to avoid a bad generator installation such as the one above. We have many references and lots of great installation pictures.